Brighter, more even skin-tone is a goal a lot of us have. Freckles, sun damage, pigmentation abnormalities and acne lesions can make our skin look less than luminous. Using Ageless Total Skin Lightening Serum daily gives your skin the ammunition against unsightly skin irregularities, leaving you with an even complexion. Most of us have some form of pigmentation issue. Maybe you cannot see it with the naked eye, but it is there. Have you ever looked at your skin under an ultraviolet light like a Woods Lamp? If not, ask your skin care professional to let you take a peek, you may be shocked to see the damage your skin has endured. Those issues that you can see with the naked eye make your skin look dull, uneven and rough. The cause of these abnormalities is in our melanin cells, which gives our skin its color. When these cells are damaged or otherwise compromised, they react by clumping together, which produces these types of skin issues. Ageless Total Skin Lightening Serum uses a combination of proven ingredients to lighten freckles, age spots, melasma (dark patches) and even calms the redness associated with Rosacea, sunburn, and post peel treatments. This serum contains Rumex, a plant derived botanical that is a tyrosinase (the enzyme that produces melanin cells) inhibitor. In addition, Kojic Acid, Mulberry, Bearberry and Licorice lighten skin naturally. Green Tea reduces inflammation, while antioxidants including Vitamin C and Emblica work to prevent further damage from free radicals. The serum is oil-free, and great for all skin conditions. 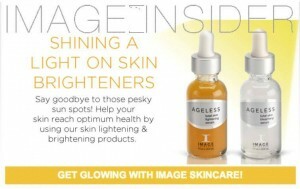 In addition to the lightening benefits, you will see tighter, younger looking skin. Using this serum daily is a great step to more beautiful skin. In addition, to decrease the chances of further damage, do not pick at your acne, this leads to scarring and worsening of the condition. Always use a sunscreen like Prevention + Daily and limit your sun exposure. Using Ageless Total Skin Lightening Serum plus following these simple rules will get you the glowing, even, gorgeous skin you’ve been longing for, naturally.